Looking for square post outdoor basketball goal system? BuiltRiteBleachers.com offers competitive pricing on Legend Supreme Get a quote today! 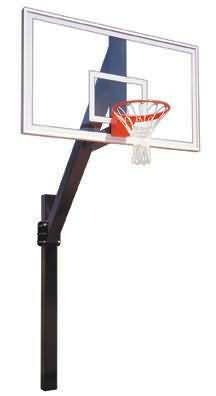 Built from heavy 6" square, 3/16" thick steel tubing, the Legend Fixed Height Basketball Goal provides unmatched stability and durability. Designed for the most rugged playgrounds, the Legend performs equally well on the home court. The post is positioned 66" behind the backboard for safety. The extension arm on the Legend is attached to the vertical post via six 5/8" high tensile bolts. Though the Legend is considered a "Fixed Height" goal, the extension arm can be bolted at any height along the post. First Team offers an array of basketball backboards and rims with the Legend. Our Response™ tempered glass basketball backboard offers the same look and authentic ball rebound enjoyed by college and professional players.